Two words commonly heard in the metal industry are hardness and hardenability. Derived from the same root, but a very different meaning. Hardness is a characteristic of the steel, while hardenability is describing an ability of the steel. In order to understand hardness, we first need to go through the process of determining this characteristic. Of course, there are tests to determine the hardness of the steel. Two of the most common ones are the Brinell and Rockwell tests. At Clifton, we utilize the Brinell, as this is considered the best practice for accurately determining hardness. To administer the test, a high-pressure load is used (usually about 3,000 kgf) and a steel ball with a diameter of 10 mm is used as an indenter. The test load (which has been predetermined) is applied to the indenter, held for a specific period of time (also predetermined), then removed. The impression that has been left by the indenter is measured across at least two diameters, then averaged. At that point, a chart can be utilized to convert the averaged diameter to a Brinell Hardness Number (BHN). The larger the diameter, the softer the material is. We do this test on two opposite corners of our plates for consistency and accuracy. The Rockwell test measures the depth of an indentation produced by a load on the indenter as well. With this method, however, there is a preliminary test force that is applied to the metal, which breaks through the surface. The pretest force is held for a specified time, then the depth of indentation is measured. After that is done, a major load is added to the preload. The force is held again for a determined amount of time, allowing for elastic recovery. When the major load is released, the final depth of indentation is measured. The hardness value is derived from the difference in the baseline and final depth of measurement. That number is then converted to a hardness number. Just like with the Brinell test, the deeper the indent, the softer the material. Because the Rockwell test indenter is a diamond tip, the tested area is a finite point in the steel, which may provide a misleading hardness reading. The Brinell test covers a broader area and is more representative of the plate hardness. Now that we know how to determine hardness, let’s dive a little deeper. We know it’s a characteristic of the actual metal, but what does it mean? To put it simply, hardness is the resistance of the steel to penetration. There are different types of steel, for example, AR400 OR AR500, that are produced to a specific hardness. At Clifton, for steel to be considered AR400, the plate must measure between 360 and 440 BHN. AR500 steel plate measures between 477 and 550 BHN. You can find more information on other grades of steel on our products pages. While hardness is a material property, hardenability describes the ability for material to be hardened by thermal treatment. To put this one simply, it talks about potential. When a piece of steel goes through thermal treatment, it’s called quenching and tempering. Tempering is heating the plate to a high temperature, and quenching is rapidly cooling the hot plate through a medium such as water, oil, or something else. When the steel is quenched, the outside of the plate is cooled rapidly. Depending on the thickness of the plate, the inner depths of the material may not cool as quickly. If it cools too slowly, the piece could have a softer core and a harder “shell”. Hardenability refers to the ability of the steel to be hardened by that process. As with hardness, there is a test to figure out the hardenability called the Jominy test. This test was developed to provide a reference to determine the expected amount of decreased hardness from the surface to the center of the bar. This is better known as the H-band and is available on standard chemistries of alloy bars, which can be found online. To perform the test, a round metal bar of standard size is heat treated, then one end of the bar is quenched with room temperature water. The cooling rate will be highest at the quenched end and decrease with distance. After it’s cooled, a flat surface is ground along the test piece and a series of Rockwell hardness tests are taken in 1/16” increments. While measuring, there will be a point that the quenched end of the material will begin to lose hardness and continue to decrease as you measure further. To recap: hardness is how hard the actual steel is based on the resistance of penetration. Hardenability is the potential the steel has to be hardened by thermal treatment. Each of these has tests associated to come up with a measurement that is quantifiable. Hardness can be measured in any condition, at any time, with the Brinell or Rockwell test. 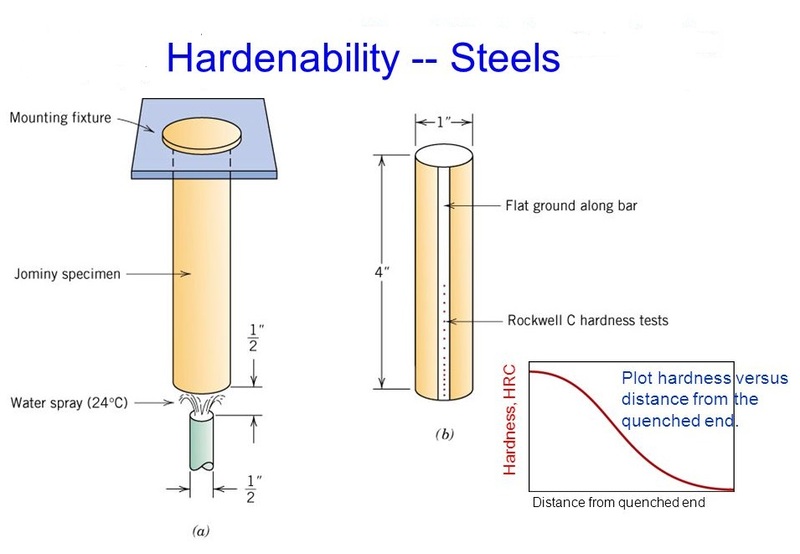 Hardenability can be gauged by using the Jominy (H-band) tables that have been developed to show you the predictable hardness of a product from surface to core. There are a number of factors that affect the hardenability of steel, the largest being chemistry. Certain elements added to steel, such as nickel or molybdenum, significantly increase the hardenability of steel. They’re normally added to alloy steels in large amounts in thicker plate or larger diameter bar. You can read more about elements in steel here. The heat treat process also has a dramatic effect on the hardenability of steel based on the media used to quench. Oil quenching is a slower quench than water, resulting in a softer steel. In the end, hardenability and hardness are tools that allow you to determine whether a product can meet your needs for the fabrication process you are using. If you are forming, you will want to consider hardness and hardenability to determine if the product will form without cracking, and what radius and die openings are required. If you’re machining, you’ll want to know the hardness to be able to determine your timing. The harder the material, the more time it will take to machine the plates. If you are welding, you will have an area around the weld that will change in hardness as well. If you need more assistance with determining suitability of a steel based on hardness and hardenability, please contact one of our product specialists at Clifton Steel.